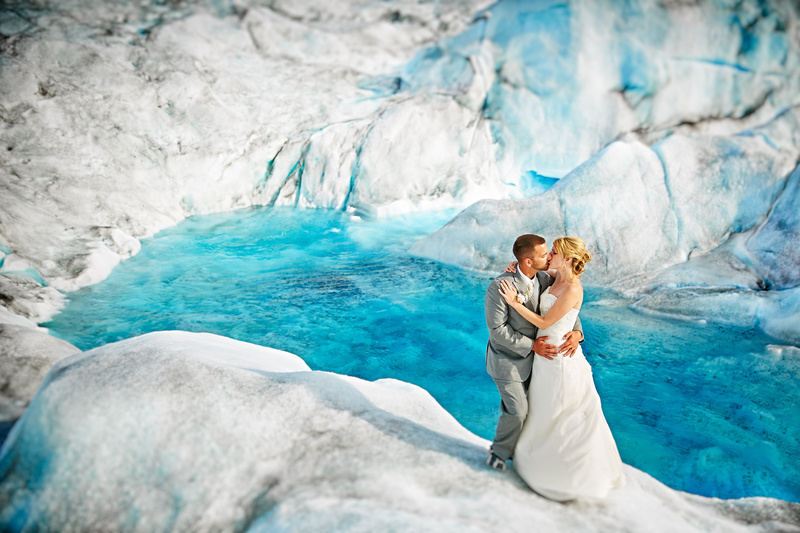 Josh Martinez, a thrill seeking photographer with a love for indigenous Alaska, first had the idea of photographing a bride in a glacier pool while piloting a helicopter over Knik Glacier. Eventually, a courageous couple came looking for a photographer who would produce out-of-this-world wedding photos. 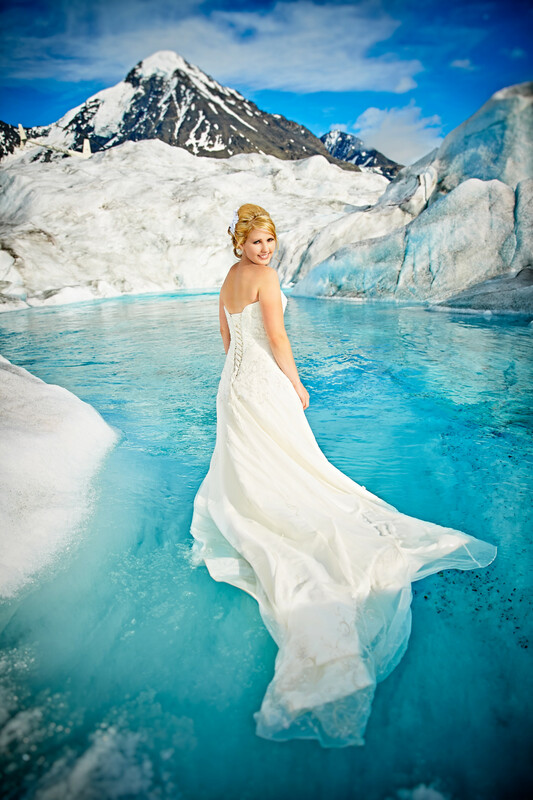 Alas, the viral sensation “Glacier Bride” was born. Martinez, who has shot all over North America, says nothing compares to Alaska. 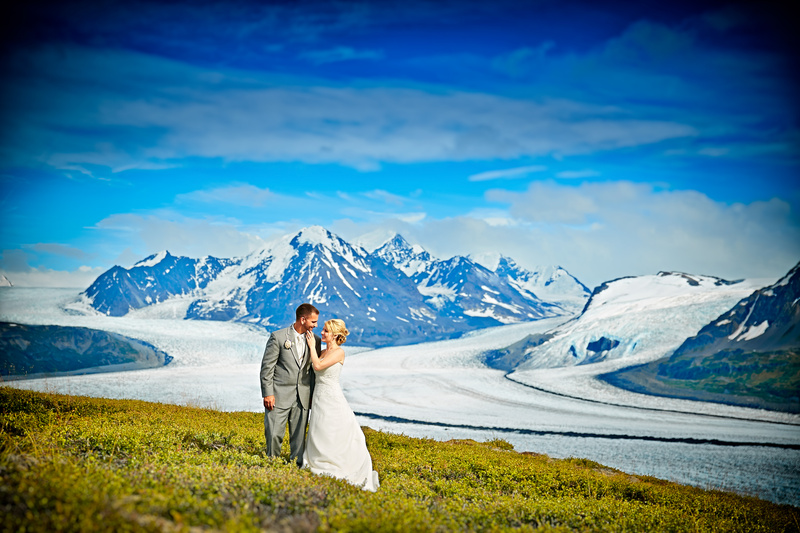 After seeing the Glacier Bride photos, we have to agree! A talented and innovative photographer alone wasn’t enough to make this shoot work though, the bride and groom Martinez worked with were willing to do anything to get the perfect shot! 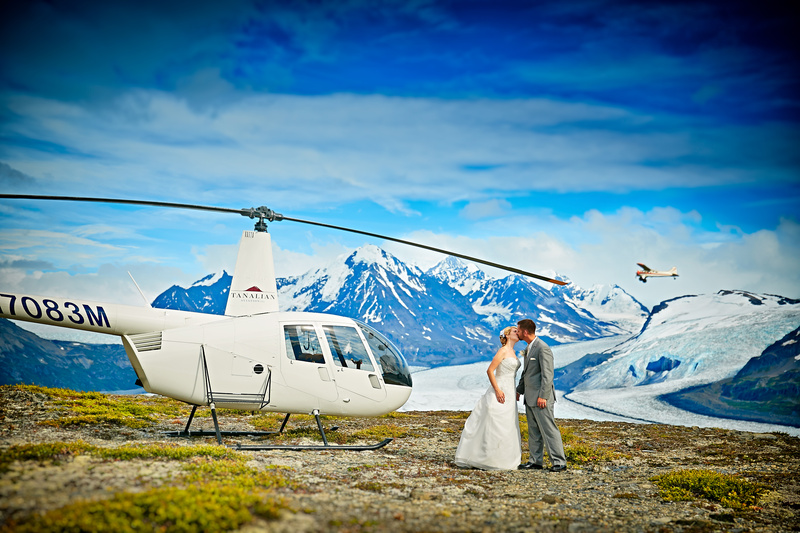 As you saw in the video above, in order to access the gorgeous glacier, Martinez and the couple traveled via helicopter. Here, the couple was caught smooching near their chariot! If you think this view is something, what came next will knock your socks off. Did we mention the couple was willing to do anything for the perfect shot? 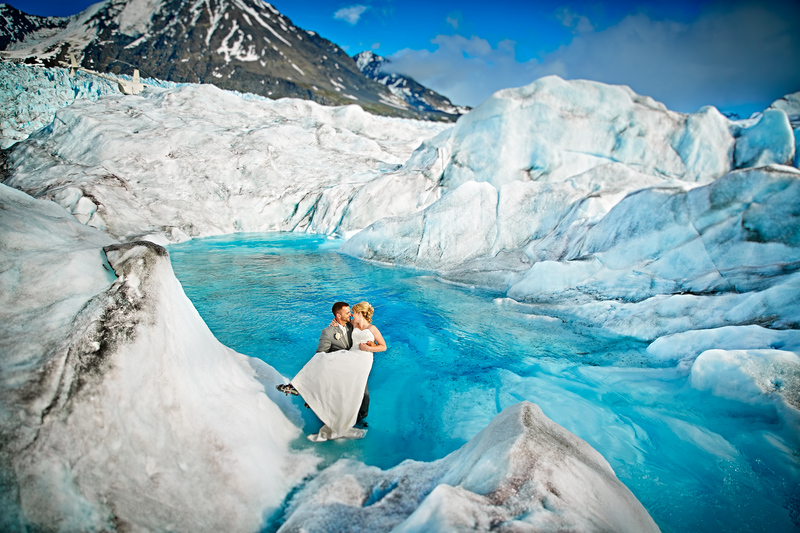 That included wading around in glacier water in their wedding attire. What we don’t know is how they gained the super human strength to look so serene in this photo. What we do know is that the work was worth it! The beautiful bride sacrificed not just her comfort, but her dress! Result? One of the most breathtaking Trash the Dress photos of all time. The contrast of the stark blue water and her gorgeous white gown is breathtaking. What Martinez has never told anyone is that he used only natural light for the whole shoot. He had brought ample Profoto lighting, but decided to nix it at the last second. Knowing Martinez lives for adventure and excitement, it was no surprise to us that his favorite part of shooting a wedding is the emotion, drama and suspense of the whole day. With all the distractions of a wedding, it can be easy to bottle up all your emotions. Those emotions tend to pour out when a photographer steals the couple away for a few quiet moments of photography, resulting in intimate photos like the one above! When it comes to his own relationship, it sounds like Martinez and his wife are picture perfect together! As far as adventures go, Martinez says “If the day ends with a glass of wine or a morning at the spa, she’s in!” Sounds like our kind of girl. The couple now lives in Nashville, Tennessee where they are raising their four children. Learn more about Josh Martinez. Keep up with Martinez’s latest adventures. Hire Martinez for your wedding day.